After three quarters, no one would have blamed Cowboys fans for turning off the TV. They’d seen this movie before, the one where the Cowboys blow a second-half lead thanks to turnovers, soft defense and mystifying play-calling. 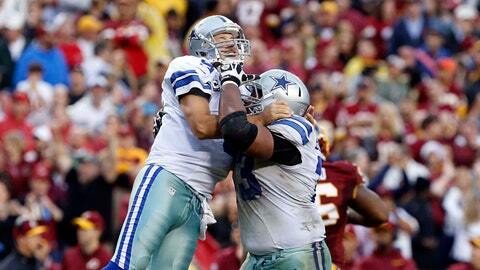 But the Cowboys changed the script in the fourth quarter Sunday against the Redskins. Major plot developments resulted in a Hollywood ending , a 24-23 Cowboys win, and quarterback Tony Romo is back to starring as an action hero. Romo directed a game-winning drive, capped by a daring, fourth-down pass to DeMarco Murray for a touchdown. It still resulted in another cliffhanger. The Cowboys must beat the Eagles at home next week to make the playoffs. But they’re still in it, thanks to a late re-write to the ending of last week’s loss to Green Bay. In that game, the Cowboys blew a 26-3 halftime lead. They committed turnovers, couldn’t get a stop on defense and stubbornly refused to run the ball. Sunday, the Cowboys initially intent on correcting things when they started the second half with a 14-6 lead. On the first play of the second half, the Redskins had seven men in the box plus a safety standing just 10 yards off the line of scrimmage. The Cowboys gave the ball to Murray anyway, who popped free for an 11-yard gain. They gave the ball again to Murray for a two-yard gain. So far so good. Then things began to look like a repeat of a week ago. Romo threw a pass to fullback Tyler Clutts, signed just three weeks ago to be a lead blocker. Clutts fumbled and the Redskins converted the turnover into a touchdown. Next drive, the Cowboys come out throwing. Romo’s third pass is intercepted, and the Redskins convert that into a touchdown and a 20-14 lead. What do the Cowboys do? Come out throwing again. Three passes and a punt later, and the Redskins are driving for another score. In that third quarter, Murray had just three carries, the same number he had in the ill-fated fourth quarter of last week’s 1-point loss to Green Bay. After the Redskins kicked a field goal to the open the fourth quarter, a funny thing happened. The Cowboys started playing sound football. They began feeding the ball to Murray. He carried the ball 11 times in the fourth quarter and finished with 22 carries for 96 yards. Another strange thing: the defense forced a punt. That allowed the offense to stage the game-winning drive. Romo, gimpy from escaping a near-sack, was brilliant during the drive and especially on the final play. This was Romo at his best: buying time with his legs, finding open targets and putting throws on the money. And this time, there was no meltdown because of a gunslinger move. The touchdown with 1:08 left meant the much-maligned Dallas defense still had one more stop to make. The Redskins never threatened a last-second field goal after turning it over on downs. All of which means we get to do this again next week when the Cowboys play the Eagles for the NFC East title. It means another week of speculating on Jason Garrett’s future as the coach, too. But for once the Cowboys’ Sunday matinee was every bit the "show" owner Jerry Jones referenced earlier in the week when asked about fan apathy. Only this time it had a happy ending.